Personality in a small package, the French Bullhuahua is a small breed of dog that has become popular over the last decade as the popularity of designer breeds increase. Strong, muscular and funny with his expressive face, the French Bullhuahua has been seen as a versatile canine companion who can fit into any lifestyle, regardless of activity level. The French Bulldog Chihuahua, also known as a French Bullhuahua, a Mexican Frenchie, Frencheenie or French Chihuahua, is the result of crossing a French Bulldog with a Chihuahua. They are a small sized breed that is loving, loyal and extremely protective of his family. This is a breed that loves his people and will often forget his small size when faced with threats to his home and people. The breed is known for its large head, bat-like ears and perky temperament that always seems happy to see others. They are an active little breed and while they can be stubborn during training, they do very well as a companion and even in agility activities that take into account their large personalities but small stature. Like many designer breeds, the French Bulldog Chihuahua became popular during the late 1990’s and early 2000’s when families were looking for unique and loving breeds. Unfortunately, this means that the breed does not have a long history and no one knows where the breed was first established. With that being said, there are breeders of the French Bullhuahua that are currently working to establish breed standards for the mixes. As mentioned above, the Chihuahua French Bulldog is a small sized breed that will vary in size depending on the parent that the French Bullhuahua puppy takes after. The breed should be slightly rectangular in shape with a muscular, solid build and a wide chest. He should have a head that is slightly larger than his body, which is often apple shaped like the Chihuahua parent. Eyes should be wide set and should bulge slightly above the short muzzle. Often, French Bulldog Chihuahuas take after the French Bulldog parent when looking at the shape of the muzzle and ears. For this reason, the breed should have medium size, bat-like ears that stand erect. The tail of the French Bullhuahua can be twisted like a French Bulldog or short and curled. . The French Bullhuahua is a small sized breed that should be short, stocky and muscular. The breed does not have a size difference between male and female and both can range in size from 6 to 12 inches in height and 10 to 30 pounds in weight. The size of the parents can be a good indicator of the size the French Bullhuahua puppies will be at adulthood. Since both the French Bulldog and Chihuahua have a short, smooth coat that is the desired coat that should be seen with the French Bulldog Chihuahua coat. The hair should be very short and tight to the body. The breed can either have a double coat or a single coat as both coat types are seen in the parent breeds. The color of the Chihuahua French Bulldog can range with many different markings. The most common colors are gold, black, white, tan and cream. Markings can be merle, pied or brindle. The Chihuahua French Bulldog is a very easy breed to maintain and require very little grooming. In general, the breed only needs to be brushed once or twice a week to keep hair to a minimum. They do require daily grooming of wiping down the wrinkles on their face and doing a daily check of their overall health but that should only require a few minutes of your time. It is very important to check your French Bullhuahua’s eyes on a daily basis and to check in their ears. Both are prone to infection and catching the problem early will prevent them from becoming an expensive problem. Bathing should be done only when necessary with your French Bulldog Chihuahua and, generally, a wipe down with a damp cloth once a week will keep them smelling fresh and free of dirt. Nails should be trimmed two or three times a month or as needed and teeth brushing should be brushed several times a week. Alert, intelligent and protective, the French Bullhuahua is a versatile dog breed that fits into many different households. The breed is known for being very affectionate and they are loyal to their family. They do well with people of all ages; however, they tend to be a bit to headstrong to do well in homes with young children. With proper training and socialization, the French Bulldog Chihuahua is a confident breed and often has a mind of his own, which can get him into trouble as he rarely backs down from a challenge. The breed can be quite stubborn and owners of the breed should be consistent and patient while raising this breed. While the French Bulldog Chihuahua can have a large number of health problems, with proper care and maintenance, this is a very hardy breed that lives, on average, 12 to 18 years. Before you look at the health problems seen in the French Bulldog Chihuahua, it is important to remember that both of the parent breeds can be prone to a high number of health problems. When choosing your French Bullhuahua puppy, choose from lines with healthy dogs and, if possible, health tested parents. Since both parent breeds are small, the French Bullhuahua tends to have smaller litter sizes of between 1 to 3 puppies with 3 puppies being the most common litter size. It is interesting to note that litters up to 8 puppies are not unheard of. Due to their small size, the French Bulldog Chihuahua is an excellent companion for people who live in apartments, although they can reside anywhere. The breed is generally very alert and this can cause some problem for apartment living if they become a problem barker, however, with training, the French Bullhuahua can be a great canine citizen. Despite their small size and sweet nature, the French Bulldog Chihuahua is not an easy breed to trained. While they are intelligent, the breed is known for being stubborn, as both of the parent breeds tend to have this stubborn streak. Training should be done with positive reinforcement, as the French Bullhuahua will often become obstinate if a harsh correction is used. This breed needs rules in their home right from the start since their small statue often makes them prone to small dog syndrome. Treating the Chihuahua French Bulldog as anything except a dog can lead to this dog ruling the roost and it can lead to problems such as aggression and separation anxiety. Start early with your French Bullhuahua puppy and make sure that the dog is properly socialized from a young age to avoid aggression problems. In addition, keep training fun and short with only 10 to 15 minutes of training being done at one time. 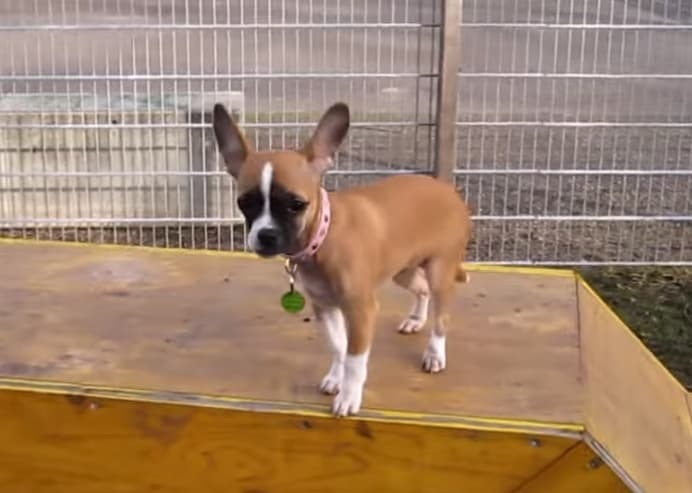 With consistency and positive reinforcement, the Chihuahua French Bulldog can be a well-trained breed…however, make sure you approach training with plenty of patience. It may be surprising, but the French Bullhuahua is a fairly active dog and does wonderful in an active household. However, the exercise needs of the Chihuahua French Bulldog can suit any type of lifestyle since the small size of the breed means they need very little room to burn their energy. On average, 30 minutes of play is enough to meet the exercise needs of your French Bulldog Chihuahua. This can be through a walk, playing in a secure back yard or playing fetch down the hallway inside. The breed is quite adventurous so it is important to keep them on a leash when they are not in a secure area. In addition, be careful visiting places with a lot of dogs. French Bullhuahuas are not usually shy and will often approach larger dogs, which could lead to accidents due to their small size. There isn’t a lot of extra care that needs to be given to your French Bulldog Chihuahua dog. In general, the breed should be fed a high quality good and given roughly 1 to 1/2 cups of dog food separated into two meals. While the French Bullhuahua is not prone to bloat, smaller meals will prevent gorging, which can cause other health problems and diarrhea for the dog. Always make sure that your Chihuahua French Bulldog has access to fresh water. In addition to their regular meals, the breed enjoy treats such as fruits, vegetables, dog biscuits and meat, however, make sure all treats are included in the daily calories to avoid obesity in your pup since the breed is prone to weight gain. There is nothing cuter than a French Bullhuahua puppy with its goofy ears that range from folded to standing upright and their large eyes. They are often very sweet puppies and are filled with a short-lived playfulness that makes many people laugh. The breed can be quite clown-like as puppies and they should be bright eyed and solid puppies. French Bullhuahua puppies are a breed that needs a lot of patience. They can be quite stubborn but with consistency, the breed will learn rules and commands. They may be a bit slow to housetrain and often do better when they are housetrained to puppy pads first. It is important to start training as soon as puppy comes home. In addition to their stubbornness, care should be taken with puppy proofing stairs and drops in your home. French Bullhuahua puppies can be prone to several bone and spine diseases and allowing them to jump up or down from places can lead to long-term health problems, sometimes debilitating ones, later in life. As mentioned above, the French Bulldog Chihuahua is a versatile breed that can fit into a range of lifestyles. They tend to be more of a one-person dog and are not suited for families with young children, unless they are raised with the children. On average, the French Bullhuahua should be in homes with children over the age of 10. The French Bullhuahua can be a stubborn breed and without proper socialization, can have aggression problems. For these reasons, they are not recommended for first time dog owners.